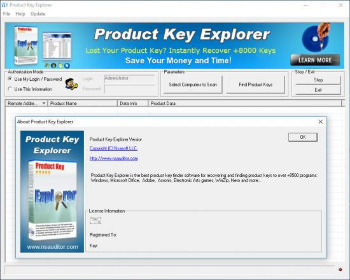 Product Key Explorer – Find product keys for over +8000 most popular programs: Windows 8.1, Windows 8, Windows 7, Vista, Windows 10, Microsoft Office, Adobe CS6, CS5, CS4 and CS3, Norton, Electronic Arts games, WinZip, Nero and more… Product Key Explorer displays product key for Windows, MS Office, SQL Server and more than 500 popular software products installed on your local or remote network computers. In order to install or reinstall Microsoft Office, Windows, or other commercial software, you must have access to a product serial key (CD Key) for that product. Product Key Explorer retrieves serial keys from network computers and allows to protect your company from having pirated software on your network. You can backup product keys to Registry File (.reg), save as Tab Delimited Txt File (.txt), CSV Comma Delimited (.csv), Excel Workbook (.xls), Access Database (.mdb), Web Page (.html) or XML Data (.xml) file, print key list or copy all to clipboard. Just right click to key list and choose appropriate option.